Do you want fries to go with your Hamburger Cupcakes? These hamburger-shaped cupcakes are not very difficult to make but they look so effective. Team the hamburger cupcakes up with shortbread, cut into thin fingers and dredged in sugar, and you have fries to go with your burger. These are great for teenage birthday parties. Or, make them for Dad for his birthday or Father's Day. Follow the recipe for my vanilla and chocolate cupcakes. When the cupcakes are cold, slice the vanilla cupcakes in half to make the hamburger buns. Slice through the chocolate cupcakes so that you have a slice resembling the meat pattie. Each chocolate cupcake can be cut into two patties. The top half can be discarded ... or eaten! Put yellow frosting in a piping bag and pipe frosting on to the lower half of the vanilla cupcake (to resemble mustard). Place chocolate cupcake slice on top. 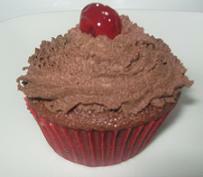 Put green and red frosting into separate piping bags and pipe onto chocolate cupcake. (Red and green frosting are ketchup and lettuce respectively). 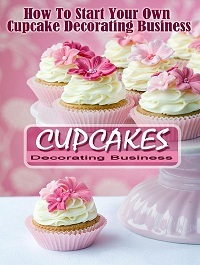 Place upper portion of cupcake on top. 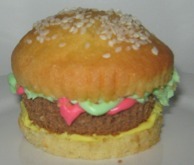 Lightly brush hamburger cupcake with water and sprinkle with sesame seeds.